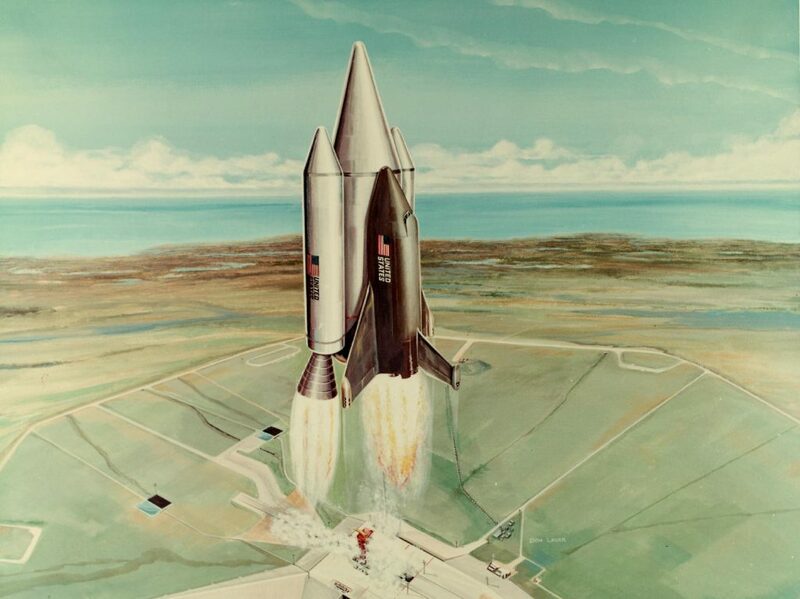 The idea of strapping rockets to a plane was pure science fiction, as likely as the UFOs the Suicide Squad ridiculed. Planes were dependent on piston engines spinning propellers. Yet this design had a built-in speed limitation because propellers lose efficiency as they approach the speed of sound, 760 miles per hour. At high speed, shock waves occur around the propeller, creating drag and slowing the plane. A few scientists had an audacious scheme to skirt the limitation: they would get rid of the piston engine and propeller altogether, developing a jet engine capable of creating enough thrust to keep the plane aloft. Critics scoffed at such an idea. It was clearly impossible, since any engine powerful enough to perform such a feat would itself be too heavy to fly through the air. Jet engines propel planes much like an inflated balloon whose opening is held tightly closed and then suddenly opened. As the air rushes out the narrow opening, it makes the balloon fly. This is because the crammed air molecules rush from the high pressure inside the taut balloon to the low pressure outside. With the size of the exit restricted, the molecules racing out create enough thrust to propel an object forward. … Barby [Barbara Canright] was sitting at a lunch counter when she first heard the term “JATO.” Frank explained to her that it stood for “jet-assisted takeoff.” The name made her smile. It seemed people would go to any lengths not to use the word rocket. Barby’s husband used the more casual moniker of strap-on rockets. 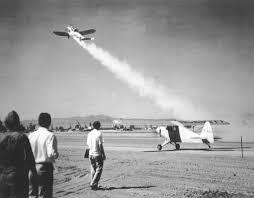 No matter what they called them, it was time to transition from firing rockets in the dry riverbed to firing rockets attached to a plane chained to the ground. August 1941 was a long string of early mornings for Barby. Waking up at 5 a.m., she dressed carefully in dresses or skirts, heels, and stockings. The men she worked with didn’t bother with formalities and didn’t worry about what they looked like, donning shirts without jackets or ties and pulling on comfortable boots. Barby, on the other hand, faithfully did her makeup each morning and smoothed the waves of her hair. Unless she preserved her curls by knotting a head scarf under her chin, they would soon be blown out on the gusty airfield. Whether wind or dust, it seemed she couldn’t escape the elements. Before she and Richard [Canright] left in the morning, they’d drink coffee in their rose-colored kitchen. As they talked about their work that day and their plans for the evening, Barby prepared herself mentally for the tasks ahead, knowing that emotions could be raw on the airfield. She let music calm her frazzled nerves, sometimes singing, “Every Day’s a Holiday” by Glenn Miller or “Boogie Woogie Bugle Boy” by the Andrew Sisters on her way to work. Dawn broke bold behind the foothills as she and Richard drove to March Field, a small airfield an hour east of Pasadena. The air was still, perfect for their experiments. By afternoon, the wind would pick up, whipping Barby’s dresses around her knees and casting doubt on the success of their strap-on rockets. The early tests were riddled by failure. The same winds that caused Barby’s hair to whip around her face also rattled the plane on the runway. They had set up a small airplane, broken off its propeller, and tethered it to the ground with chains. The engineers hoped these would steady the craft and limit accidents. The chains were there for safety because their rockets weren’t yet ready to take the plane into flight. The plane they had tied down was an Ercoupe, a small single-seater with a low fixed wing covered in shiny aluminum. It weighed only 838 pounds and, after the war, had the distinction of being sold in the men’s department at Macy’s. The team secured the rocket engines, starting out with two on each side, directly onto the fuselage of the plane, ripping a ten-inch-wide hole in the skin underneath the wings to bold it on. In the cockpit was Liutenant Homer Boushey, a former student of von Karman’s, now an army pilot. It was up to him to ignite the engines filled with explosive-packed powder. The first time they ran the experiment, the rocket engine misfired. No one knew why. The second experiment was much worse. Four jet units were attached to the airplane, and one of them failed immediately. Its exhaust nozzle bounced down the runway, eventually striking the fuselage of the plane and tearing a large hole in its skin before shearing off one of the combustion chambers. That combustion chamber was thrown clear of the airplane, about a hundred feet. In a lab notebook, they wrote, “The blow was rather violent causing the rear attachment of the angle irons to pull loose and the dural wing covering immediately above the exhaust nozzle position to stretch, pulling loose 4-5 rivets.” The group were shaken up by the accident. They had managed to rip apart what Ercoupe’s advertisements proclaimed to be the “world’s safest plane.” At least no one was hurt. In addition to her notes on the experiments, notes similar to those every engineer recorded in a slim, brown lab notebook, Barby made long charts of numbers. 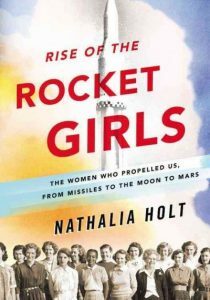 She calculated the thrust produced by each rocket engine and how it corresponded to the flight results. She was looking for clues in the performance of the rocket engine—hidden data that might reveal how to get the plane to fly. Over the next week, they repaired the plane and built a secure holster for the cylindrical bottle-shaped rockets. They even added two more rockets, bringing the count up to six. When the pilot got back into the cockpit, everyone was more than a little anxious. They pasted posters to the nose of the plane, demanding BE ALERT! DON’T GET HURT! The signs served as a reminder of their close call. Barby held her breath as the plane hovered in the air, pulling against its chains. That flight, only a few feet off the ground, was the first hint that the rocket plane they had once dreamed of might actually work. Four days later, on August 12, 1941, they took off the chains. The airfield was quiet. Baby spoke hardly a word. It seemed that all their hard work had been building toward this one experiment. Happily, the results matched their high expectations. The rockets were able to reduce by half the distance the plane needed to take off. As Bushy got out of the cockpit, he was grinning. It was exactly what the army needed, and it demonstrated that JPL could deliver. On that sunny day in August, the team took a photograph alongside the plane with its rockets strapped on. The petite aircraft would soon change the future of JPL. Standing on the airfield, Barby felt the cool touch of the metal plane on her warm skin. Even in the hottest part of the day the shell reflected heat back to the sky. Similar to the patchwork of parts that formed the rocket plane, the pieces of Barby’s life had also come together in the past few months. The science classes she had taken, the risk in moving from Ohio, and even her unfulfilling work as a typist at Caltech had all culminated in this one accomplishment. Like Barby, the rocket plane was just beginning to show what it could do. Now that they had strapped six rockets onto it and watched it take off, it was time to push the limits. Although they were no longer called the Suicide Squad and their ranks had expanded slightly, they hadn’t stopped taking risks. The next step was to attach twelve JATO units to see if the rockets alone could power a launch. When the small plane went airborne without the aid of a single propeller, it made the first American rocket-powered airplane flight. The timing could hardly have been better. Four months later, a rocket-powered plane would be urgently needed. The Canrights were enjoying a quiet Sunday afternoon on December 7, 1941. Barby was in the kitchen, cooking and listening to the radio, when the announcer interrupted the program with breaking news. The Japanese had attacked Pearl Harbor. Barby fell to the kitchen floor, tears streaming down her cheeks. The war had hit home. Hawaii suddenly seemed very close to California. Barby and Richard were glued to the radio for the rest of the evening. In their dark hour, Barby heard the first lady’s potent voice on the broadcast. When Eleanor Roosevelt said, “We know what we have to face, and we know that we are ready to face it,” Barby knew that their work would now take on a new importance. Going in to the lab the next day, they might have been talking about Pearl Harbor, but they were thinking about the rocket plane. *All of the excerpts on my blog are from books that have stayed with me for some reason—because the concept was awe inspiring, changed how I view the world, was beautifully expressed, or all three. ‎I personally curate all of the book excerpts and always obtain the author’s approval before posting their work on my blog.